Hello All! It's been quite a while since I have posted. I have been focused on the house plus I have had a spell of very long days at work. While I enjoy my temporary home, it has lengthened my commute quite a bit. Sometimes it takes me 2 hours one way! I get home rather late and quite tired so I have had little time for sewing. Regardless, I do have sewing plans. Whether I can achieve them in the near future remains to be seen. I purchased this lovely cotton print knit at NY Elegant Fabrics. I like the autumnal colors as well as the "dusty" look it has. I really love how it looks against the charcoal grey corduroy I purchased at Mood Fabrics in NYC. I have already sewn up the printed knit jersey into a long-sleeved crew neck top. Nothing fancy. The charcoal grey fabric is absolutely beautiful. It is a medium weight fine wale corduroy, very soft and it feels luxurious. 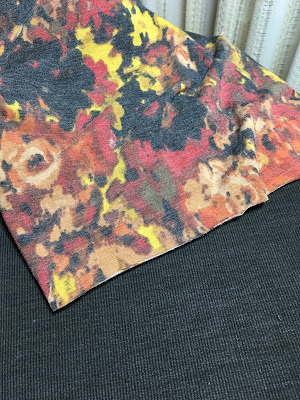 I want to make a pair of jean style corduroy pants out of this fabric. However, I have decided to make a muslin first. 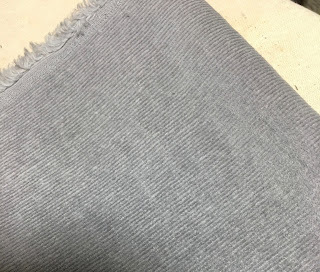 I have a light grey medium weight corduroy in my stash that I am using as a muslin. If it comes out reasonably well (I hope), maybe it can be a wearable muslin. Since I had a long 5 day weekend for Thanksgiving, I was able to draft the pant pattern and cut it out in the muslin fabric. Back to the routine tomorrow, though, so I don't know when I will pick this up again. I have very little spare time during the week and the time I do have I spend reviewing and preparing paperwork and answering emails regarding the house. As I said in a previous post, I am the recipient of grant money from the State of NJ for homeowners who suffered property damage due to Hurricane Sandy. The grant covers part of the cost for elevating the house. Of course, it brings with it quite a lot of paperwork that needs to be reviewed and submitted within certain deadlines. 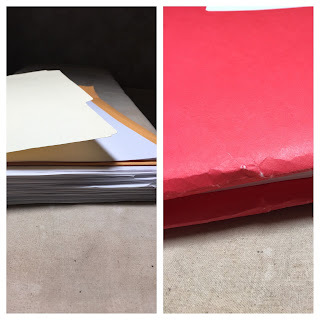 On the left, papers filed. On the right, papers to be filed. The weekends I spend doing chores and running errands as well as visiting the job site and recording the week's progress. The contractor is close to finishing up. I am working with the power company so that the gas meters can be installed. There's still quite a few odds and ends but we are close to finishing....just in time for the holidays! So I foresee lots of cleaning up and packing while in the midst of Christmas shopping...so I don't know when I will get sewing again - bummer. Regardless, for those of you celebrating the upcoming holidays, I wish you all a safe and happy holiday season.